Well, now you can worry less, because you have MagCloud–and we’re working to make it easier for you. With Ship to Group functionality we can take on the heavy-lifting of drop-shipping to your mailing list and you won’t have to deal with pesky paper-cuts or trips to the post office. Digital distribution gives you the option to share a PDF with your users who prefer to stay up-to-date with their iPad or other digital device. And you can get it all done without having to leave your desk or get out of your PJs (no judgement here). So since it’s the start of a new year, what better way to turn over a new leaf with your organization, than to turn a glossy page? Your publication can look professional and still be affordable if you publish through MagCloud and we’re going to help you get started right now. 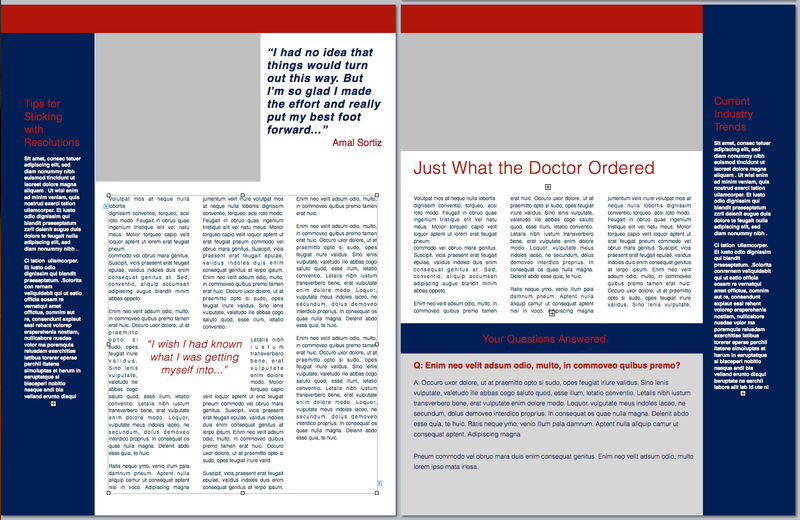 To make the process easier, we created a classic newsletter template designed for printing as a 4-page MagCloud publication (which comes to just 60¢/copy if you order 20 or more copies). It’s easy to edit and available in three software formats. 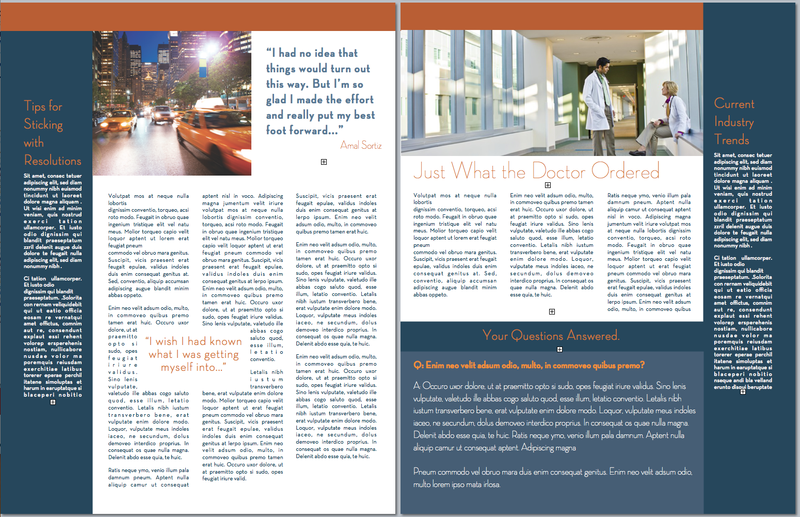 Check out the original and a variation of the template on the left, and then get started creating your own in Adobe InDesign (CS3 or newer), Microsoft Word or Apple Pages. *Please note, you may have to “right-click” or “ctrl+click” to start the download. Starting with a template is a great trick for speeding up the design process (don’t tell anyone I told you, but a lot of professional designers do it themselves) and many well-designed templates have style sheets built in that make it easy to change fonts and styles with just a few clicks of the mouse. So with a few simple typeface changes, tweaks to color, and some new imagery, you can easily transform this basic template into a newsletter that fits your organization’s image. We used Neutra typefaces and swapped in orange for our example, but how you customize it is up to you. Want to try a different design? Depending on your software of choice, you can also find great resources built into some applications or as free downloads in their online resources. Apple Pages has built-in templates that can be great starting points, just be sure to check your margins and settings because these layouts may need a bit of adjusting so that they are properly centered on the page after printing/trimming. For more detailed help with this task check out the “Add guides to pages and adjust layout for trim” section of last year’s blog post. Microsoft also has free templates available for Word and Publisher online at office.microsoft.com. If you’re willing to splurge and buy a template, from an online source like stocklayouts.com, be aware that most of these templates are not designed to MagCloud specs and will need to be adjusted to 8.5″ x 11″ pages in order to output a properly-sized, MagCloud-ready PDF. So before you spend the money, be sure you select a file format for software you are comfortable with, and that you are prepared to make the necessary changes to set the file up to match our PDF specifications. Still needing more inspiration? Check out some of our past blog posts for newsletter content and design tips, or great sample publications. And as always you can find all of MagCloud’s design Tips and Tricks and all of our free templates in our Design Resources section of the blog. 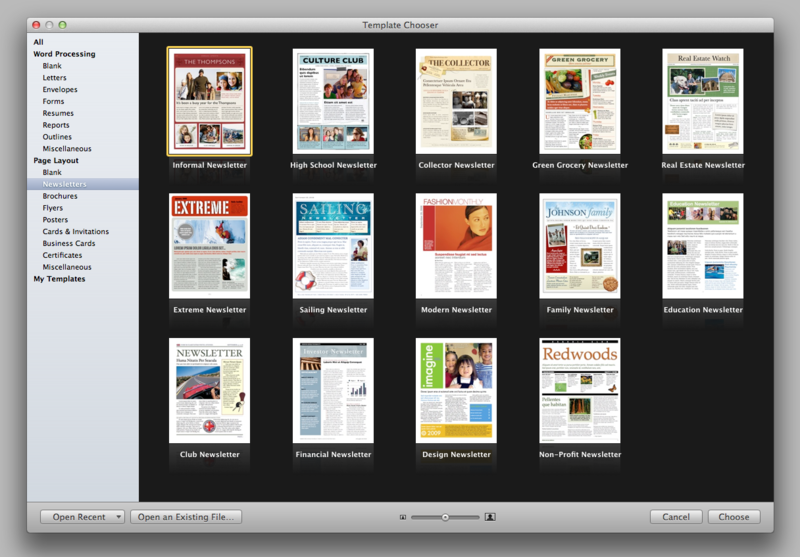 Have you found other great templates or resources to use when creating your MagCloud publications? Then please share them below in the comments section. You heard that right. MagCloud can help bring your professional projects to life in print and digital. Our service is a great way to showcase your work to customers, clients, colleagues, partners etc. Besides magazines, we’ve seen a variety of creative ways that MagCloud customers have used our service for their most demanding business needs. So whether you are creating a portfolio for client meetings, company brochure, customer newsletter or product catalog, MagCloud will take your publication from PDF to printed magazine and digital download with just a few clicks of the mouse. Planning an event? We’ve got you covered there too. Our event planners and marketing customers have utilized MagCloud to print event souvenir programs, meeting programs, handouts and brochures. You can even publish your workshop manuals with us too. Whatever the purpose – fun, commemorative, professional or informational – there are no boundaries to the way people are using MagCloud. Let us bring your story to life. MagCloud can help promote your company, products and services in both professional quality print format or digitally for viewing on a PC or mobile device. Whether you are ordering 1 or 1000 copies, MagCloud will ship your business documents to customers and colleagues all over the world. Visit magcloud.com/work and learn about the many ways we can help you make your next gallery exhibit, client meeting, workshop, convention and fundraising event that much better. What other ways do you use MagCloud? Share your past, current projects and future ideas in the comment section below.